The team at Tesco Extra on Wrekin Retail Park is putting all its efforts into raising as much money as possible for the supermarket’s charity of the year – Cancer Research UK. A number of events have been held by staff over the last year with money still coming in to the fund. Colin Rogers, the store’s .com manager came up with the calendar idea which then sparked a series of fundraising events. Sadie Griffiths, store manager, said: “This charity is very close to our hearts as we currently have seven members of our team who are recovering from cancer. It was very important for us to be able to raise money for a charity like this. “Nationally, Tesco is aiming to raise £10 million to help more people survive cancer and keep families together. We feel privileged that we can play an active part in the fundraising. “So far we have raised more than £6,000 for Cancer Research UK. I am very proud of everyone’s efforts but the fundraising does not stop and we will be trying to continue to add to the national target. “I am sure our staff who are suffering from cancer appreciate the fundraising efforts. It can be very difficult when someone is suffering from something like cancer to carry on as they would normally do. Over the past few weeks a number of fundraising events have been held by the store, including the making of a fun video of the management team singing to the Band Aid song – Do They Know It’s Christmas. The plan is to sell CDs of the record to staff to raise money. 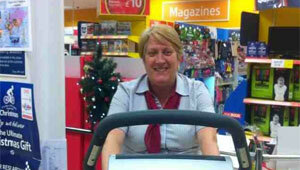 Staff also took part in an exercise bike challenge at the front of the store from Telford to Lapland for Cancer Research UK over three days which raised £715, while staff posed for a calendar called Calender Girls and Boys 2013 with aims to raise more than £1,000 for the charity. A food bank was also run in December in collaboration with Fairshare when customers could donate tins and non-perishable food for the homeless. Tesco then added another 30 per cent which helped to raise enough to provide 4,379 meals for the Fairshare charity.